Last week, we completed our study of the seven churches of Revelation. These churches were chosen specifically for a message from God to the world. It is a message of hope. No matter what your spiritual condition, there is always work to do and there is time to repent for your wrongs. This week, Jesus reveals more of what must come to pass. In the last lesson, specifically in the letter to Laodicea, Jesus said “Behold, I stand at the door and knock. If anyone hears my voice and opens the door, I will come in to him and eat with him, and he with me. The one who conquers, I will grant him to sit with me on my throne, as I also conquered and sat down with my Father on his throne.” In chapter 4, John sees a door and enters the throne room of Heaven. In the letter to Philadelphia, Jesus is shown as a door and as holding a key to the door. Here, John sees a door standing open in Heaven. Compare to John 10:7 and John 10:9. As he steps into the throne room, John sees a vision of God on the throne. It is a vision because no man can see God and live (Exodus 33:20). This vision is mirrored closely in the first chapter of Ezekiel. (Ezekiel 1:26-28, 1 Timothy 6:16). Around the throne, there are 24 other thrones with Elders. Who are these elders? Actually, there is a good bit of debate on the identity of the elders. • Some say they are God’s heavenly council. • Others say they are redeemed saints. • Some say they represent the 12 apostles and the 12 patriarchs of the church. • Some say they represent the 24 hours in the day and are symbolic of eternal worship and praise. Depending on your perspective, you could make an argument that they are saints, or apostles and patriarchs, because people—not angels—are promised crowns and the reward of reigning with God. However, you could also say these are God’s council of heavenly servants who we have seen repeatedly throughout scripture bringing messages to mankind. 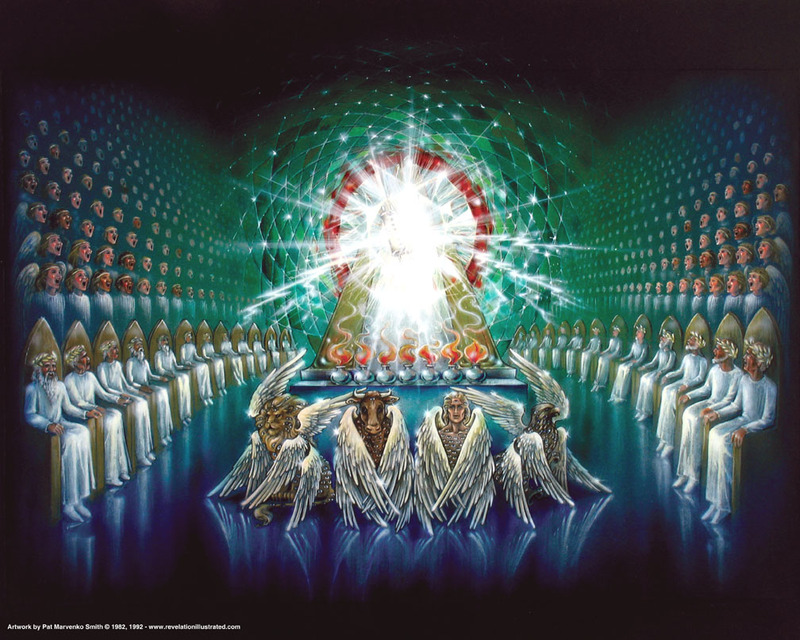 In front of the throne John sees seven torches of fire, which are the seven spirits of God. What are the seven spirits of God? What might these two interpretations regarding the sea mean, in your opinion? Skip ahead a bit in Revelation and read the description of the new Jerusalem in Revelation 21:1. Also in scripture, we see that water is used to cleanse (the flood, baptism) and that demons avoided water (Luke 11:24). In Revelation 22, the new Jerusalem is described as having a flowing river. The Hebrew word for water is Mayim. The Hebrew word for Heaven is Shamayim. Do you see how separating the waters from the waters makes sense in that respect? Some people say these living creatures were symbolic of all living creatures on earth—the pattern God used at creation. Who or what do you think these creatures were? Read Isaiah 6:2-3. There is also a good, though long, description in Ezekiel 1:4-14. In ancient records, a scroll with writing on both sides was said to be complete, so the scroll with the perfect seals (seven) could be symbolic of completion or the end. A deed written on a scroll might also have had writing on the outside to indicate the content of the scroll. What might Jesus, the Lamb, have a deed to in this vision? Look at the new song in Revelation 5.